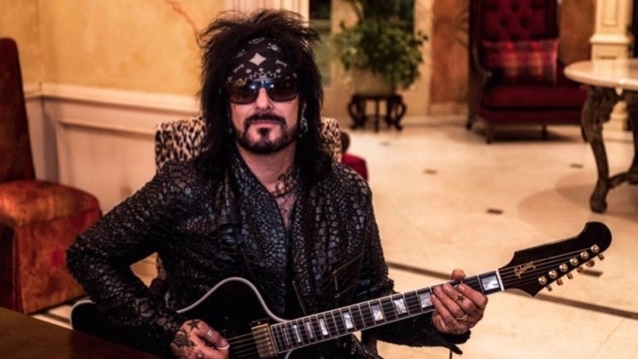 MÖTLEY CRÜE bassist Nikki Sixx and his wife, Courtney Sixx, are expecting their first child together. "We are over the moon excited to be having a baby," Courtney told Us Weekly. "Nikki is going to be the most amazing dad in the world because he already is." The 60-year-old rocker is already a father to four children from previous marriages. He shares three kids — Gunner, 27, Storm, 24, and Decker, 23, with his first wife, Brandi Brandt; and a daughter, Frankie-Jean, 17, with his second wife, "Baywatch" star Donna D'Errico. This will be 33-year-old Courtney's first child. Nikki married Courtney in March 2014 at Greystone Mansion in Beverly Hills, California. "He is such a hands-on dad," Courtney told Hello! back in 2015. "His three older children — Gunner, Storm and Decker — all grew up living with Nikki full-time. He took them to school every morning, helped them with homework, packed their lunches daily and continues to do that now with my stepdaughter Frankie." She added: "For someone with such a demanding schedule, it's always amazing to me how he manages to be there for his kids so strongly. He is the best father I have ever seen." Courtney also revealed that she was hoping for a baby girl. She explained: "Since I'm only going to have one, I feel like I need to have a daughter." Sixx and Bingham had been dating since 2010, shortly after the breakup of his relationship with tattoo artist Kat Von D.